From superbug to… bug. Newly discovered chemical compounds can make MRSA bacteria vulnerable to the antibiotics they normally resist, restoring the old drug’s former powers. 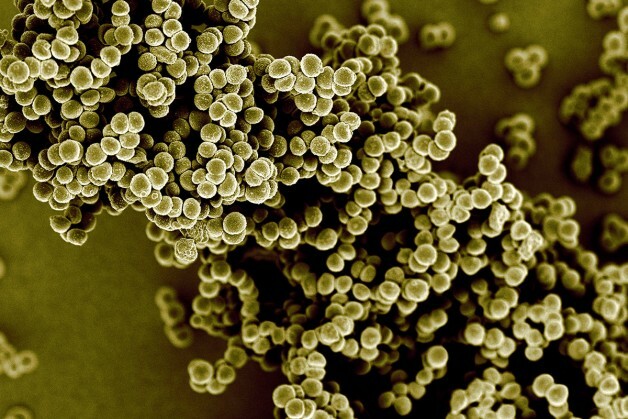 Methicillin-resistant Staphylococcus aureaus, commonly known as MRSA, is a major cause of hospital-acquired infections, and the second biggest cause of death by drug-resistant bacteria in the US. These bacteria are resistant to the most widely used class of antibiotics, called beta-lactams, which include penicillin, methicillin and carbapenems. These drugs work by targeting essential components of a bacterium’s cell wall called peptidoglycans. But MRSA protects itself by using a type of molecule that can soak up the drug and stop it from working. Now Christopher Tan and colleagues at Merck Research Laboratories in New Jersey have found a way to break this resistance. They have identified two compounds that make beta-lactam antibiotics powerful against MRSA again. Called tarocin A and tarocin B, these compounds target a different part of a bacterium’s cell wall, called teichoic acid. Neither of these drugs kill bacteria on their own, but when either one is combined with an antibiotic, the combination can kill MRSA in both clinical samples and in infected mice. The compounds haven’t yet been tested in humans. But there is a snag: if the combination alone was used to treat patients, bacteria could become resistant to it. To get round this, Tan suggests adding a third drug that targets another part of teichoic acid production. “We think by having a deep understanding of the biology of this particular pathway, it enables us to identify where the weak spots are in the bacterium to address resistance,” he says. This method of using existing antibiotics in combination with compounds that restore their potency could be a powerful weapon in the global antibiotic resistance crisis. A similar strategy is already used to treat Escherichia coli and pneumonia that have become resistant to beta-lactamase. These bacteria have an enzyme that breaks these antibiotics down, but adding compounds that inhibit this enzyme makes beta-lactams more effective. Brown believes we need to apply this strategy more broadly. His charity is funding a screening programme to see if any existing compounds also work as antibiotic resistance breakers.